I am known for being a bit of a bargain hunter. Not crazy coupon lady kind of stuff, just if there is a way to get a better price on something I am going to purchase anyway, why not use it. I like to delegate. It’s fun. So today, I am assigning you a task. Don’t worry, it will take less than two minute to complete, so don’t bother writing it down. Just do it. 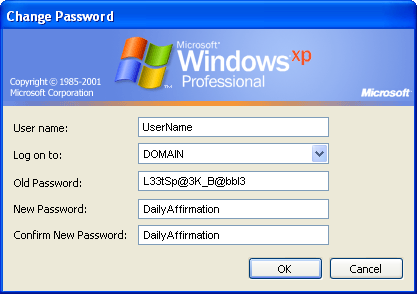 TASK – Change your computer password into a positive daily affirmation. Instead of using gibberish passwords like l33tsp3@k or deceased pet names, use a positive affirmation or goal to reinforce good behavior. Simple.